When people ask, “What is TMJ?”, they are usually referring to temporalmandibular dysfunction or TMD. In order to answer the question, “What is TMJ?”, it’s helpful to understand the basics of how the jaw works. What Is The Temporalmandibular Joint? The TMJ is a small joint that allows the jaw to open and close. It can be easily felt just in front of the ear as you open and close your mouth. This joint is like a hinge that allows the lower jaw, or mandible, to open and close. This joint is constantly working as we talk, eat, breath, and often continues to work as we grind our teeth in our sleep. It consists of a ball like condyle on the mandible that fits into the socket of the skull. Between these two parts there is a disc that acts like a cushion to absorb stress and helps the jaw move open, that is attached to the back of the joint. 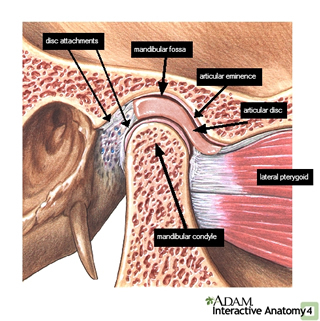 The muscles around the TMJ act to help stabilize the joint and move the jaw. All these structures must work together in order for the TMJ to work properly. Temporalmandibular joint dysfunction can arise if any of the TMJ structures fail to work in concert with other structures. Grinding or clenching the teeth due to stress or recent dental work can disrupt the normal movement of the TMJ and create pain. Trauma such as a fall or blow to the jaw can also cause injury to the TMJ and effect the normal mobility and function of this joint. Some of the symptoms of TMJ include pain with opening/closing your jaw, talking, yawning, and eating. You may experience pain or difficulty opening your mouth while taking a large bite, as in eating an apple, or chewing and biting down on your food. In some cases, your jaw can lock up, keeping you from opening or closing your mouth at all. If you are experiencing TMJ pain or have questions about what is TMJ, contact us to set up a free screening session to see if you are a candidate for one of our programs.